Meredith Huston was like a lot of teachers, browsing Pinterest to get ideas for her students and then spending hours searching Dubai for materials of the right quality. 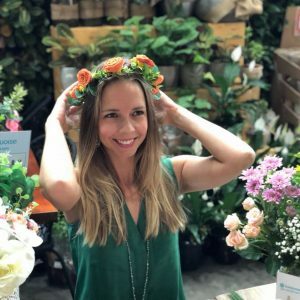 The American elementary-school teacher, who is also a yoga instructor and has lived in the Middle East for eight years, found she enjoyed the hunt so much – in addition to the “fun bit” – that she began inviting friends over for crafty nights. August marks the official launch of the concept Huston developed out of her love of teaching and sharing all things DIY. 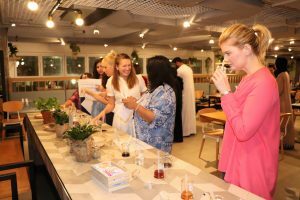 She started Turquoise Boutique Studio to bring all the wellness benefits of the do-it-yourself movement to the people of Dubai. Turquoise helps guide people to go on their own creative adventures, by sourcing materials from all over the globe and then putting on workshops, events and team-building experiences. There are almost two dozen projects on offer, so people can make jewelry, macrame wall hangings, essential oil-based perfumes and terrariums. There are stamp and printmaking opportunities, fresh-flower crown and string-art workshops. 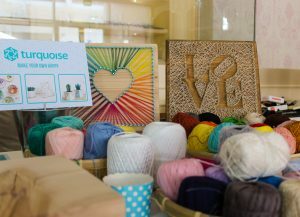 Huston also offers DIY kits – for sale through LittleMajlis.com and coming soon to Souq.com – as well as video tutorials through her YouTube channel. 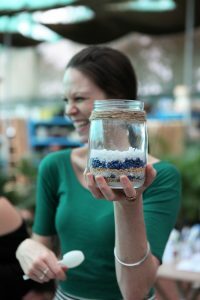 Leading up to the official launch, Huston had already conducted more than 50 DIY workshops and held activities at five regional events, most recently a series of longer, two-hour sessions focused on string art at the Dubai Design District’s recent Happiness Journey in March that drew a waiting list. When Huston started seeing repeat customers, some who have become friends and started attending workshops together, she realised the value of providing team-building exercises. She’s not surprised that the concept has caught on, considering the psychological benefits that come from being swept up in the combination of focus and effort known as “creative flow” – benefits that research shows boosts overall happiness. A 2016 study published in the Journal of Positive Psychology, for example, found that engaging in creative activities contributed to an “upward spiral” of positive emotions and psychological well-being – feelings that were experienced into the next day and that led to more creativity. • Turquoise Boutique Studio is offering two new workshops, both in Dubai: A macramé grocery bag-making dinner at 7pm, Sunday, September 2 at The Workshop (Dh210); and a dreamcatcher-making session, 7.30pm, Sunday, September 16 at ReTold (Dh195). For more information, go to TurquoiseBoutiqueStudio.com.